For the last two weeks people have questioned the motives behind Trump's actions during his trip abroad. Huge weapons deal for the Saudis? No shift in the Israeli-Palestinian relationship? A movement away from NATO and G7 partnerships? Today we learned a little more about the first stop on his trip. A little context. Back in 2015, the Qatari royal family began actively supporting the Muslim Brotherhood (similar to how the Saudi royal family actively supports Wahhabi Islamists) against the wishes of the Saudi family. While the Muslim Brotherhood and the Wahhabists have similar aspects in their broader goals, at the micro-level they could not be further apart. The main difference is their deference to the Saudis, namely that the Muslim Brotherhood wants to overthrow the House of Saud. And for the Saudis, that's obviously a big no-no. Meanwhile the Saudi-sponsored Wahhabists gave us Daesh, the Islamic State (ISIS). What particularly irked the Saudis was a phony story in Qatari state media (al-Jazeera) about how the Saudis and the Brotherhood were mending fences. Tensions got so heated that the US stepped up its military presence at the al-Udeid airforce base around the same time that the State Department sent a delegation to Qatar in June 2015. Officially the visit was a trade matter but sociopolitical matters were also addressed. Fast forward to Trump's trip this past May when he addressed a new joint Arab force set up to combat terrorism. The speech itself was nothing out of the ordinary for Trump. A lot of boasting and self-aggrandizement. The $100 million bribe his family was given by the Saudis to not ask any questions was well-noticed in the speech which clearly took aim at certain terrorist groups and not others. Particularly striking was the absence of the phrase, "radical Islamic terrorism," which Trump hammered to a pulp during the election. In an editorial published on Monday, The National newspaper owned by the United Arab Emirates (UAE) government also denounced Qatar's "false friendship" citing the "close ties between Doha and Tehran". "Iran's actions in the Middle East have cost Doha's Arab neighbours blood and treasure," the editorial said, adding "the regime across the Arabian Gulf is no friend to Doha". Al Jazeera senior political analyst Marwan Bishara, however, said the accusation "does not hold water", noting Abu Dhabi also maintains diplomatic relations with Tehran. "And yet it prefers to sever its relationship with Qatar, rather than with Iran," he said. In a separate statement, the Qatari Cabinet said the measures taken by the five countries against Doha were "unjustified". "The aim is clear and it is to impose guardianship on the state. 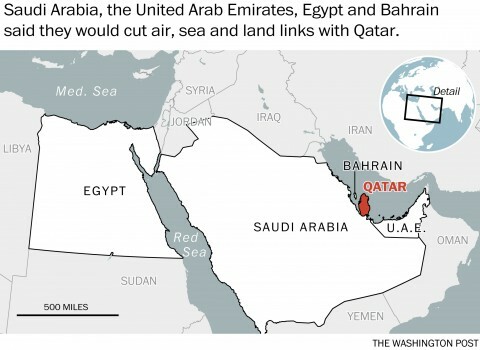 This by itself is a violation of its [Qatar's] sovereignty as a state." Sealing off a country is a recipe for war. The real question is why now? $300 billion in weaponry suggests the Saudis are through playing with the Qataris. There will be a war and much like what's happening in Syria, nothing good will come from either side winning. In the end, Trump's good buddy Erik Prince stands to be the biggest beneficiary by playing both sides as he's always done. I'll say it again, nothing good can come of this.